The specific history of this folk song is difficult to trace. While variants of both the text and the tune can be traced back to 18th-century Ireland and England, many are so different that it is difficult to know where one version ends and an entirely new song with the same title begins. The melody and text for this setting are based in part on a version collected in 1918 by Cecil Sharp and found in his English Folk Songs from the Southern Appalachians Vol. 1. 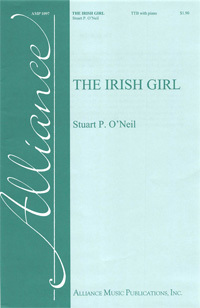 Set in the Dorian mode, The Irish Girl is full of longing and melancholy; it speaks of a true love separated by great distances. Since the verse form is repeated several times, dynamic contrast is essential in maintaining interest. The piano provides a fluid, almost guitar-like texture that should help provide forward momentum. Resist the temptation to over sing the forte sections at m45 and particularly at m70 as the piece should maintain a thoughtful and elegant quality throughout. Although set for TTB voices, many passages feature only two parts; make sure that the bass part is adequately balanced throughout the piece.